Exodontics is that branch of dentistry which involves the art and science of extracting teeth. Teeth that are indicated for extraction can present to the practitioner anything from a relatively uncomplicated, non-challenging and brief procedure to one that is complicated, challenging and time consuming. Fractured crowns are commonly seen in practice, and also, bilateral fractured crowns, as in this case. What caused this weakness in the tooth, whether genetics, nutrition, or trauma, we can only speculate, but it does make oral extractions very difficult. The use of burrs and bits to section teeth can help accomplish these types of oral extractions much easier and faster, but extreme caution must be taken to not damage surrounding anatomical structures. The use of quality radiographs is a necessity when attempting this procedure. 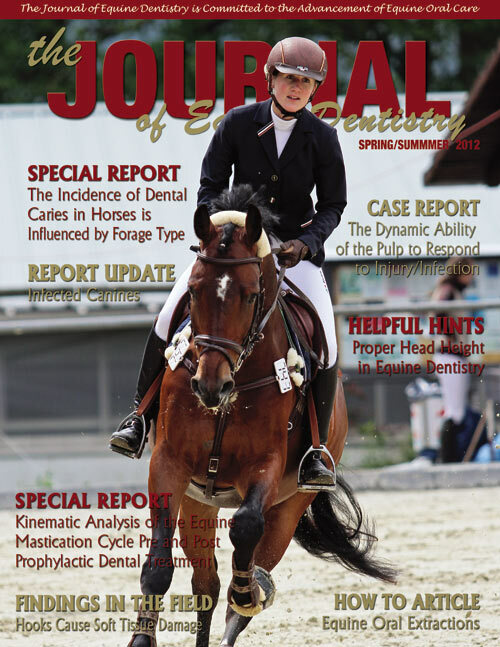 Equine dentistry is unique in the fact that horses have hypsodont teeth which erupt and mature their entire lives. These lengthy, large teeth are securely anchored by periodontal ligaments in the extensively large prognathic maxilla and mandible. The size and type of teeth, plus the unusually large bone structure and depth of oral cavity, creates a challenge for the dental practitioner; requiring specialized equipment and advanced training in oral extraction techniques. The circulatory system is composed of two co-operating subsystems: the blood vascular system and the lymphatic system. The blood vascular system forms a complete, connected circuit that begins and ends at the heart. Its function is to transport blood carrying oxygen and nutrients to all parts of the body, and to remove waste products produced by normal cell activities. Five kinds of vessels can be found in the blood vascular system: arteries, arterioles, veins, veinules, and capillaries (Fig. 1A, 1B, Fig. 2). Arteries and arterioles carry freshly-oxygenated and nutrient-rich blood away from the heart; veins and veinules carry de-oxygenated and nutrient-depleted blood back toward the heart. (This is true of all blood vessels except the pulmonary arteries and veins, which perform opposite duties). A minimum invasive buccotomy of the 409 was the next plan to get the 409 out. The horse was still sedated and the 409 was still blocked with lidocaine with 2% adrenaline. We tubed the ductus parotideus with a small tube, so it was easy for us to feel and follow the tube through the skin. Extractions can be very difficult with many complications. It is important to have good communication with the owner and be very upfront about procedures. Not every plan will be successful so as a practitioner there must always be a “Plan B” and in some cases a Plan C and D! 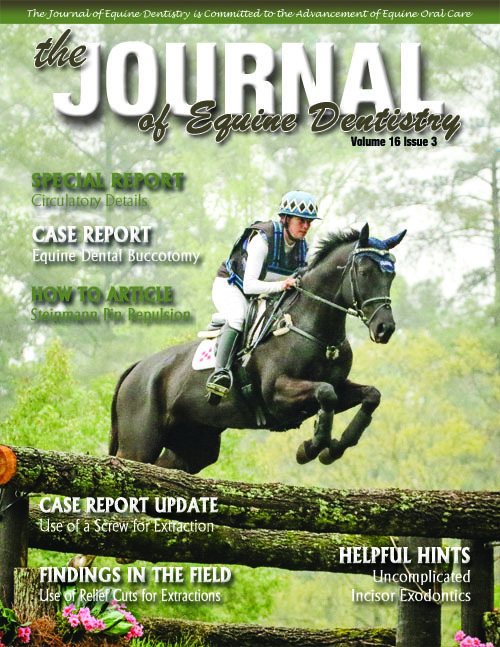 The benefit of performing equine dental relief cuts is beneficial to the horse in cases of periodontal disease and impacted teeth. However, sometimes an extraction is necessary and relief cuts can aid in the removal of a tooth. It is imperative to know the anatomy of the mouth and to have had experience with advanced cases before performing relief cuts. 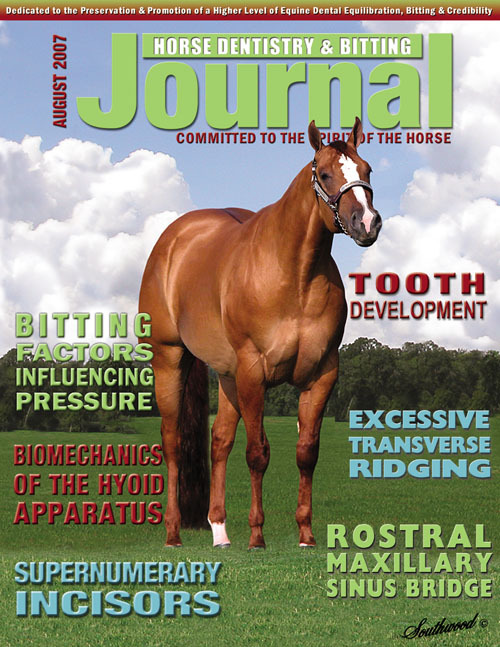 It is also important to correctly equilibrate the horse mouth to promote proper axial flow. This will allow the teeth to clean naturally so that periodontal disease is less likely to occur. The best way to approach any case is to have as much information as possible in order to make a well-informed decision. As a practitioner, it is essential to have the proper equipment, necessary radiographs, and the knowledge and experience to deal with the problem. Relief cuts can become a useful procedure for extractions keeping in mind that the horse will have to be regularly evaluated. Sagittal factures of the upper cheek teeth are thought to occur from weakened infundibulum due to decay and erosion of the internal cementum. The most commonly affected teeth are the first upper molars. Genetics may also play a role since this is often a bilateral condition. Oral extraction of these types of fractured teeth is indeed a challenge for the oral practitioner and requires team effort. 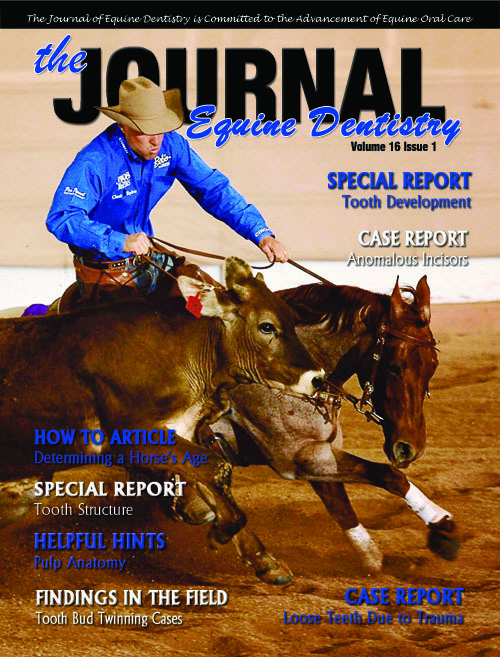 Proper instrumentation, digital radiographs, and effective nerve blocks are necessary before attempting these complicated extractions on a standing horse. A proper examination and good inspection of the infundibulae with an oral probe and a mirror can provide much information about the cheek teeth. The intraoral extraction method is a technique with a huge advantage over repulsion techniques as it allows for maintenance of a sealed barrier between the oral cavity and the sinuses. Oral extractions allow faster recoveries and a quicker return of function to the animal because post-operative complications are greatly reduced. Four months following the procedure to remove Jessie’s 109 and 209, she was reexamined to evaluate healing. On arrival, Jessie was bright and alert with no evidence of nasal discharge. Palpation of the gingiva covering the alveoli of the extracted teeth revealed complete healing and no foul odor was noted. Visualization of the same region with a dental mirror confirmed that no drain tracts were present. As with all the different extraction techniques available, proper case selection will be critical for this approach to work. 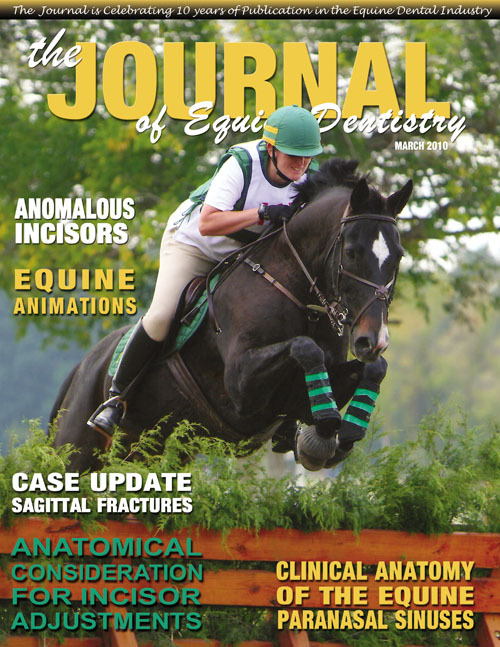 Fractured mandibular and maxillary premolars and molars are commonly encountered in equine practice during oral exams and routine floating. Removal of the affected tooth is often the only treatment option, but oral extraction can be difficult without an intact clinical crown. Dental crowns can also be fractured during oral extractions thus increasing the difficulty of removing the remaining portion of tooth. 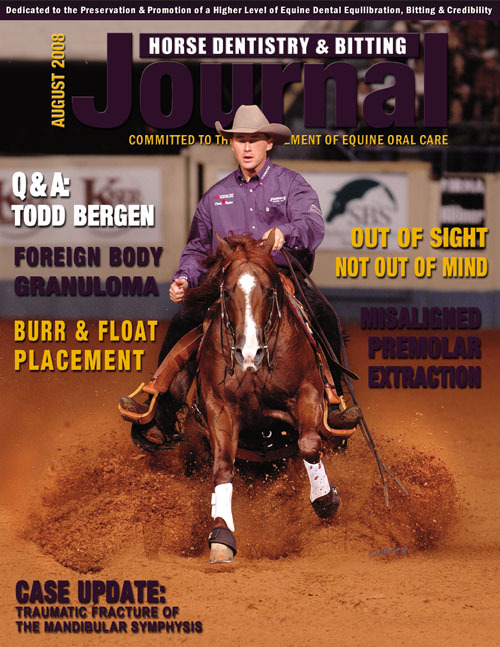 The goal of this paper is to describe a minimally invasive Steinmann pin repulsion of fractured cheek teeth that can be performed in the standing horse.